Smart Technologies is expanding its Smart kapp portfolio of collaboration displays with Smart kapp IQ, an ultra-high-definition 4k display that combines the original Smart kapp whiteboard functionality with multiway, multidevice collaboration. Kapp iQ connects via any Android or iOS device, allowing users to invite any Web-enabled device (remote or on site) to join for real-time collaboration. Anything written on the display is broadcast to anyone, anywhere in the world; participants can then make notes on their own devices that immediately display back on the kapp IQ. The kapp IQ uses the existing Smart kapp app, with upcoming IQ premium features such as digital inking over content. Upgrade to the Plus subscription to unlock additional collaboration features. Smart kapp iQ will be available in June in two sizes: a 55-inch model priced at $3,999 (MSRP), and a 65-inch model priced at $4,999 (MSRP). 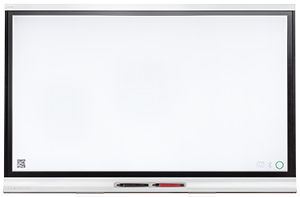 Because the kapp iQ uses the same panel technology as the Smart Board 6000 series, "many existing customers will be able to retrofit their boards to acquire the power of kapp iQ," according to a press release. For more information, visit the Smart kapp site.